Our physical therapy staff is thoroughly trained to treat orthopedic and neurological problems in patients of all age groups – from pediatrics to geriatrics. Our therapists possess a high level of expertise and a unique understanding of how the individual components of the human body’s neuromuscular system work together to perform a given activity. During your initial visit, you will be given a thorough biomechanical evaluation, from which we will analyze movement patterns and design a treatment program to address your specific deficits. 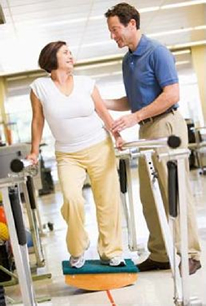 Your treatment goals will attempt to decrease pain, increase mobility and improve function. Our professional staff utilizes several different modalities (heat, cold, electrical stimulation) to prepare tissues for stretching procedures and to enhance your ability to perform an individualized therapeutic exercise program.